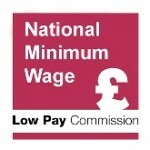 We have recently seen further public naming of firms found to be non-compliant with the National Minimum Wage. It follows closely on the heels of plans announced by the government in September. These include higher penalties on employers, more funding for HMRC (which enforces the NMW) and even disqualification for directors. But exactly how much non-compliance is there? This is a question the Low Pay Commission takes a close interest in, but is surprisingly hard to answer. Problem #1: you get different answers depending on whether you look ‘top down’ – relying on data for all workers - or ‘bottom up’ - adding up data sources for individual groups. Starting with the top-down approach, about 208,000 workers over 21 were paid less than the adult rate of the minimum wage in the most recent data (April 2014). This number comes from the most authoritative UK source on hourly pay, the Annual Survey on Hours and Earnings (ASHE) which is based in turn on a one per cent sample of National Insurance records. However, there are legitimate reasons why some workers can be paid less than the adult rate - in particular, apprentices in their first year of training, or workers whose employers provide them with accommodation. The Commission’s working assumption has been that these reasons account for less than half of the number reported in these data: which leaves underpayment of at least 100,000 unexplained, much of which might be non-compliance. So, 100,000 is a ballpark estimate. But this figure differs significantly from non-compliance measured ‘bottom up'. Analysis by the LPC - and many other organisations - has over many years identified several overlapping groups at risk of not receiving the minimum wage including workers in social care, apprentices, some interns and migrant workers. Looking at specialist data sources focused on these specific groups suggests larger numbers are not paid compliantly. The best source on apprentice pay - the Apprentice Pay Survey - finds 14 per cent of apprentices not receiving their due – a figure equivalent to over 100,000 workers (though this is self-reported and, for reasons we have explored in detail likely an over-estimate). Care workers are the most high profile at-risk group. Here there are also six figure estimates on numbers underpaid - though research is sensitive to assumptions about travel time and other variables. The two biggest unknowns in terms of scale are interns and migrant workers. On the former, a range of data sources suggests thousands of internships each year are paid below the NMW. For example, recent research that the LPC commissioned found that 13-16 per cent of graduate interns were unpaid. However it is not known how much of this is illegal non-compliance - genuine volunteers are not required to be paid the NMW. Frustratingly, there is no easy way to establish employment status through workforce surveys. Overall, the scale of non-compliance is a story of competing data sources. The best pay source, ASHE, provides a reasonable estimate for workers in firms responding to official surveys, but an evidently incomplete one. The challenges do not end there however. 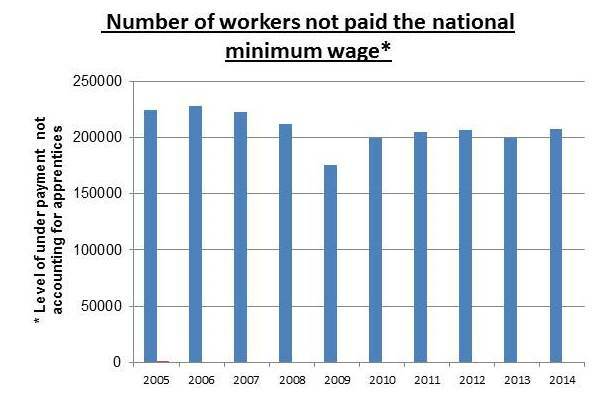 The figure the LPC derives from ASHE for underpayment - about 208,000 workers, some of whom are not receiving the NMW for legitimate reasons - is small in comparison with the total labour force. It is about 0.8 per cent of workers aged 21 and over, which sounds modest. But is the total labour force the right comparison? Just over 5 per cent of workers get the NMW at the moment (this proportion is set to increase sharply with the introduction of the National Living Wage): most are higher up the distribution. Whether or not middle and higher earners are receiving the minimum wage is arguably an unhelpful way of assessing the impact of the UK’s pay floor - a policy that applies to everyone but is intended to protect those at the bottom. A better comparator is coverage - those paid at or below the NMW. About 1.2 million workers over 21 were paid at or below the adult rate in 2014. On this basis approaching one in six workers covered by the NMW was paid below it, perhaps half of whom - one in twelve - may be non-compliant. 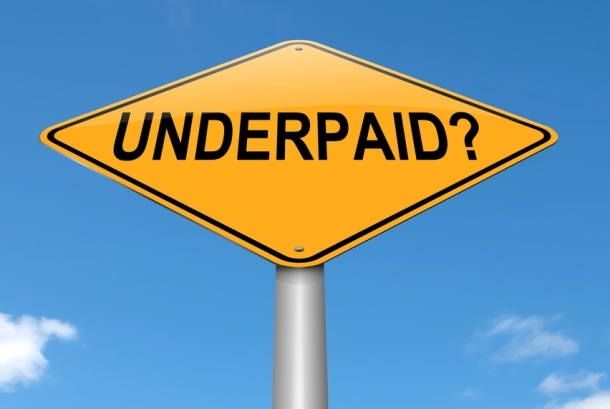 The UK’s pay floor needs to apply in practice, not just in statute. That is why the LPC actively monitors non-compliance and reports annually on what we think is happening to both the level and the effectiveness of policy. What the numbers tell us is that to some extent we are flying blind. The available data suggest a range for the scale of the problem, but significant data gaps remain. Estimating the level of non-compliance with greater certainty requires better data on, for example, pay in the informal economy (not captured by official data sources), the scale of non-compliance in social care and apprenticeships, the extent to which interns are volunteers or genuine workers, and also (a topic for another day) whether self-employment is being used as a loophole to avoid the NMW. These uncertainties matter in their own right but have new relevance in the context of the introduction of the National Living Wage. The change in the NMW means that workers aged 25 and over will see a big increase in pay in April 2016, and - assuming the economy strengthens and Government expectations on employment are met - further increases in the relative and real value of the NLW towards 2020. Alongside higher pay, the system will be slightly more complex (five, not four age bands), and start affecting some occupations and sectors that have not been touched much by the minimum wage before. Pay will also change at a different time in the year from now - April for workers 25 and over, October for other workers in 2016 (The Government is currently reviewing whether and how to align the dates). Given all these factors, it is important that the benefits of higher pay are not lost in higher non-compliance. Does a higher minimum wage automatically mean higher non-compliance? Not necessarily. Past data on the trend in underpayment offer possible encouragement - a higher bite in recent years has seen underpayment as a proportion of total coverage actually fall. But it will depend on effective policy and HMRC continuing its more activist stance of recent years. It will depend too on good data: no enforcement system can be better than the numbers it has to work with. ASHE, the best source on hourly pay in general, does not cover the informal economy, relies on the accuracy of employer records and also under-samples the very lowest paid workers (those paid below the Lower Earnings Limit). Other sources tend to be smaller-scale, are self-reported (so may overestimate hours, or underestimate pay) and are administered by groups and bodies other than the Office for National Statistics. The LPC will continue to play its part in addressing these weaknesses - including through our annual programme of commissioned research. We also encourage Government to look in further detail at the data unknowns. It is currently consulting on exploitation in the labour market and its plans include a new intelligence hub with better data-sharing. That could be a step forward. Understanding the numbers is a vital prerequisite to systemic reductions in the problem.